Note: BIGA closed on December 29, 2018. I'm hopeful that the owner will try again soon. 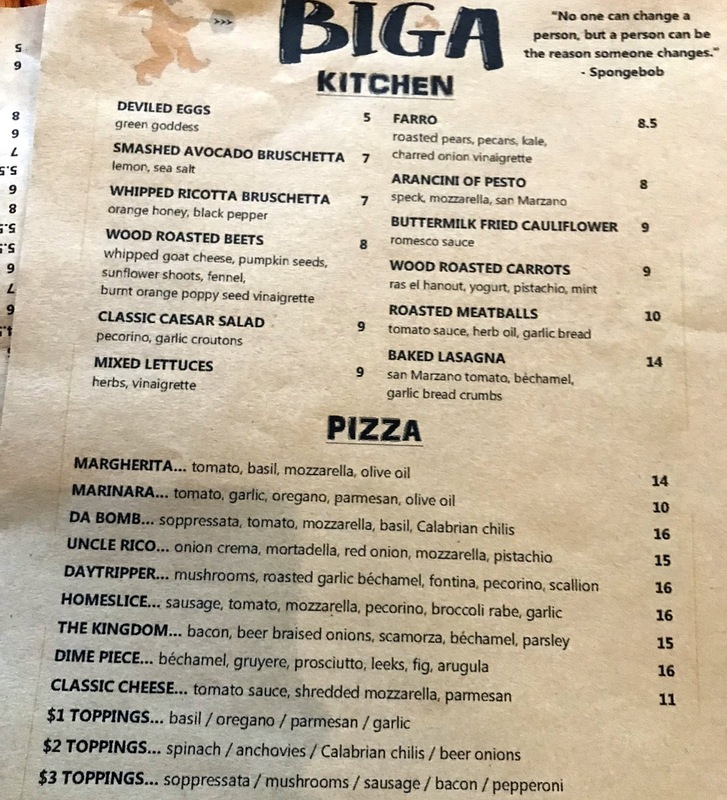 Meanwhile, a new restuarant "Bodega" will occupy the space, but not offer pizza. See link in the comments section. 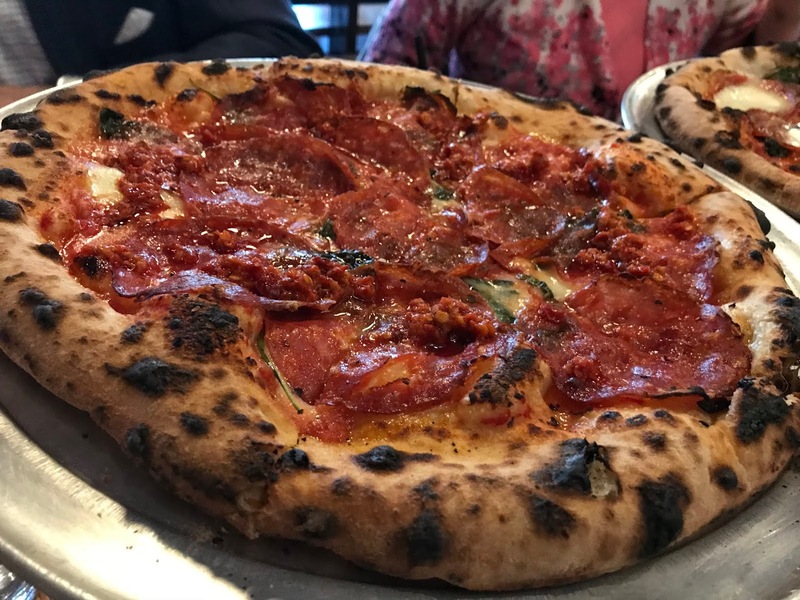 There's a lot of great restaurants on Philadelphia's storied Main Line, but this prosperous stretch of western suburbs hasn't fully participated in the pizza renaissance blossoming nationally. Other than a cluster of good pies in Wayne, such as Jules Thin Crust and an outpost of Anthony's Coal-Fired Pizza, Main Line pizza eaters have been stuck in the 90s. BIGA opened in May of 2016, and quickly got onto the radar of local foodies when legendary Philly food critic Craig Laban wrote a review seven months later. On a Wednesday night in October, I visited with three others to try four different kinds of their 12" personal size Neapolitans. 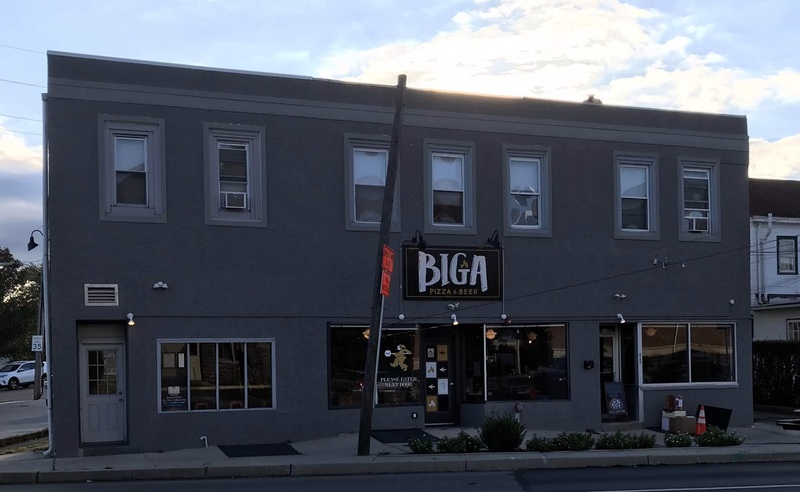 From the outside, BIGA looks like a place that has been around forever; flat gray walls on an old boxy building. The interior, which seats about 40, has a cozy brick and wood decor that makes you instantly feel welcomed. 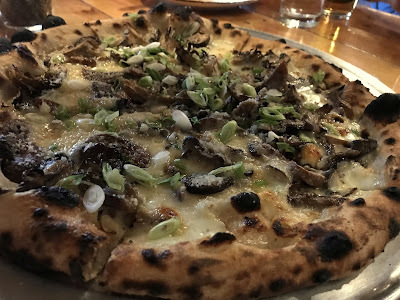 Owner Sean Weinberg cites Brooklyn's Roberta's and DC's 2Amys as inspirations for both the pizza and the decor, and those are both superb destinations. Weinberg has a high end restaurant Alba in Malvern (at the Western-most end of the Main Line). 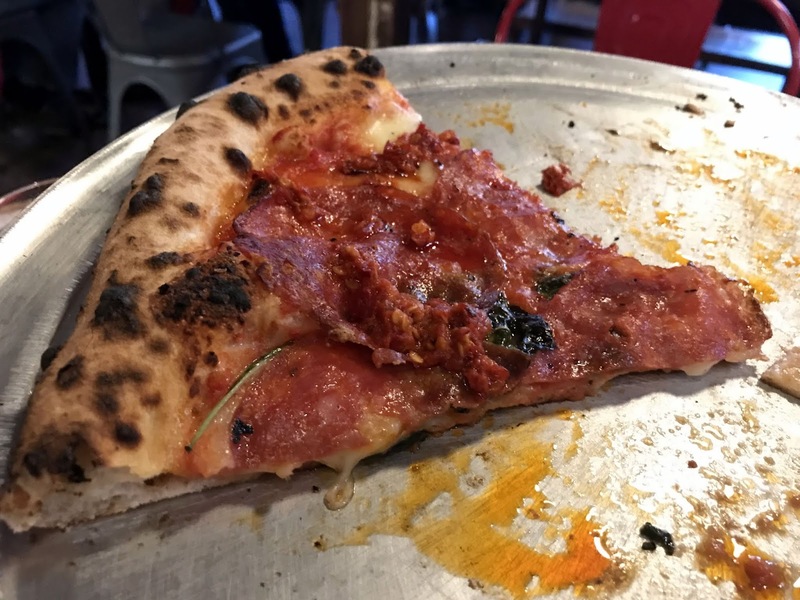 Here, according to Laban, "he and chef Steve Fulmer have put a lot of energy into refining their dough (a 48-hour process that fosters complexity of flavor), a bright raw tomato sauce just touched with basil, and a series of toppings that range from traditional ('Margherita') to unconventional." BIGA offers a nice selection of draft beers and over 80 kinds of bottled beer (though I can't understand why anyone would choose a bottle over draft beer). 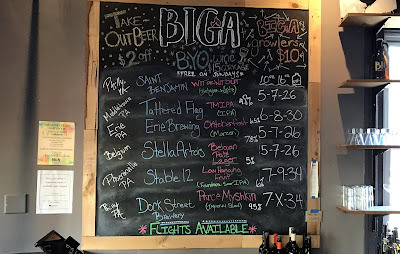 The Saint Benjamin Belgian Wit I had paired nicely with our pies, but there are plenty of more serious IPA style beers too. We shared as an appetizer of the buttermilk-crusted fried cauliflower, served with an almond-thickened base of red pepper romesco sauce. It was as light as fried food can be, and the texture was perfect - delicate and soft inside without being wet or mushy. It was garnished with some nice pickled onions. Like all good Neapolitans, these pies cook quickly in the high-heat wood-fired oven. 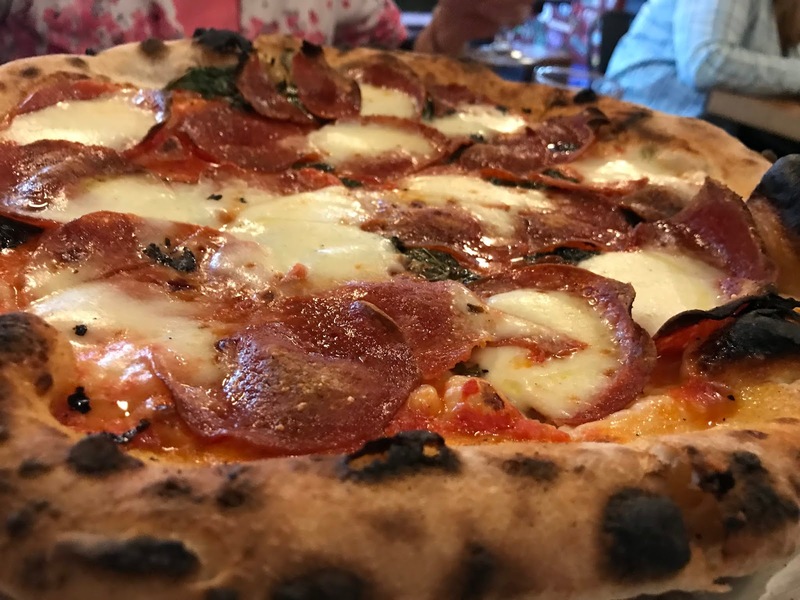 The Margherita is always the baseline to assess a pizzaiolo, even though we added the pepperoni to ours. The crust was perfect - ideal leopard spotting on the puffy cornicione, thin and chewy throughout, and no soggy spots anywhere. As with any great pizza, the crust was good enough to eat without any toppings. Tomato sauce on a pizza can be old-school long-cooked gravy style, or it can be applied to the pizza without any previous cooking, as it was here. I like both ways, but this style - fresh and vibrant - suited these Neapolitans perfectly. The cheese was excellent quality but kind of a role player to hold all the other ingredients together. The pepperoni was outstanding - large thin circles that curled and crisped even during the brief time spent in the oven. After our meal, I asked the pizzaiolo about the pepperoni, and he told me it was made by DiGiacomo Brothers in nearby Conshohocken, PA. 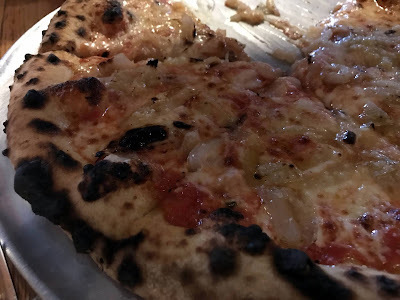 The Da Bomb pizza had quite a bit in common with the Margherita, with an identical crust, sauce, and fresh mozzarella. 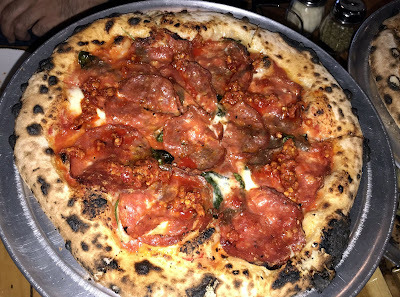 The soppressata was not very different from the pepperoni on the Margherita, but what made this pie sing was the Calabrian chilies, applied judiciously in a way that gave it a very warm but not overpowering heat. It was a favorite of our group, an especially well-balanced pie. 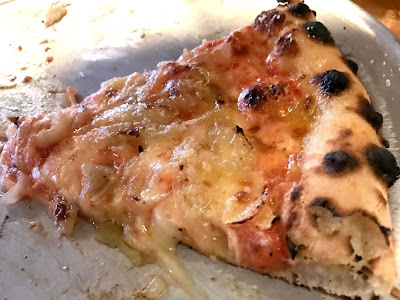 We chose the Classic Cheese because one member of our party prefers standard aged mozzarella to the fresh variety (I do too, on any non-Neapolitan pie). He was intrigued by the beer-braised onions and ordered those as a topping. 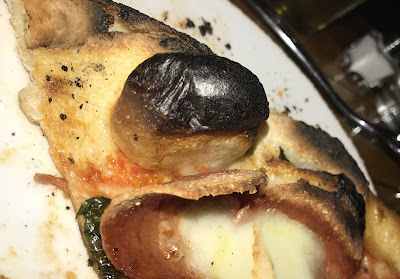 This pizza - in my view - is offered as a compromise to those who want their pizza to look and taste like the ordinary pies they ate before the pizza renaissance. It certainly looked conventional, with that pale orange melange of cheese and sauce. 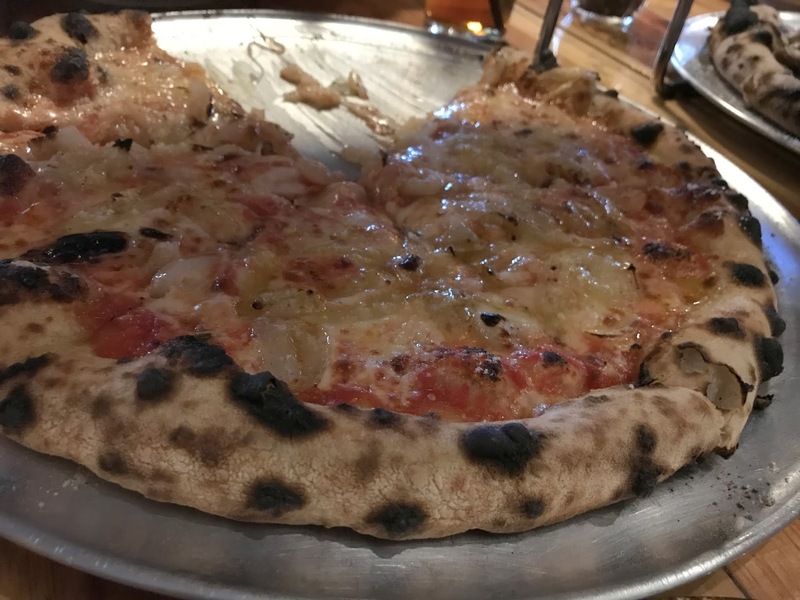 However, those unremarkable toppings riding on this fantastic crust, enhanced by the beer-braised onions, made for a very satisfying pizza. 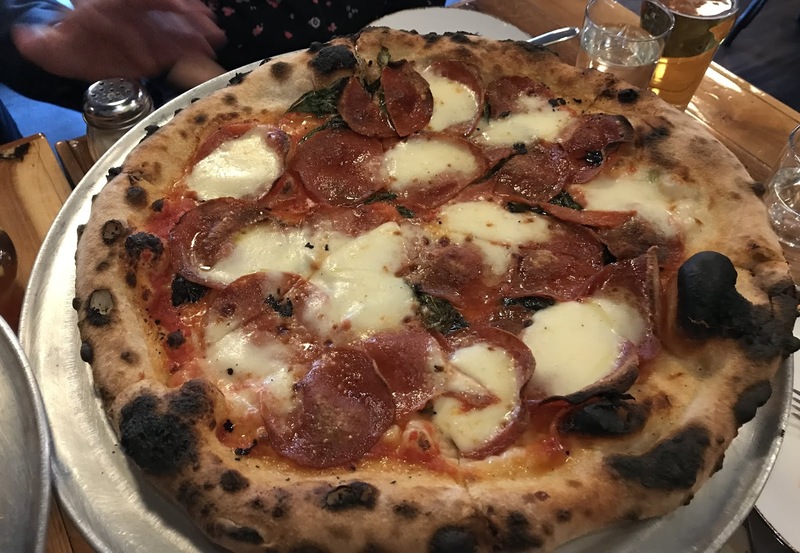 Despite a big cheese payload, that Neapolitan crust was not overwhelmed, and like the other pies, the Classic Cheese was an ideal balance of flavors and textures. The pie that most surprised me was the Daytripper. 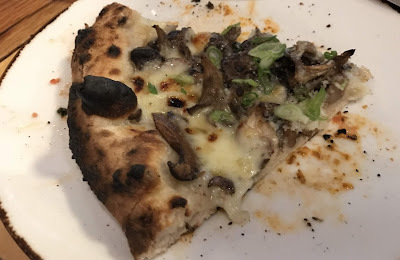 This white pie was just a flavor explosion; I'm not sure what kind of mushrooms were used, but they were bursting with umami, and it was doubled by the cheese blend, the garlic bechamel, and the liberal application of diced scallion. Four pies, four winners. 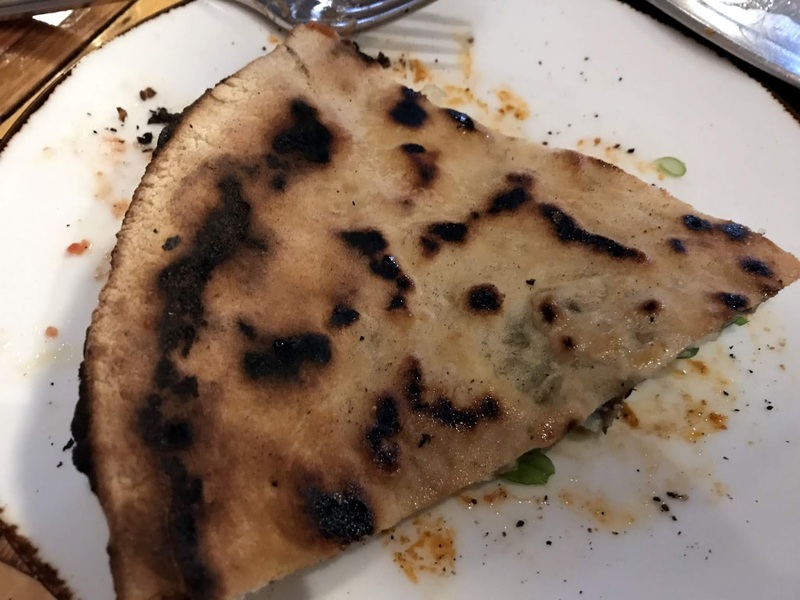 The crust here is wonderful; perhaps not better than Vetri or Capofitto in Philly, but you can talk about them all in the same sentence. What elevates BIGA above other Neapolitan pizzerias is how thoughtfully-chosen and well-balanced these pies are. A lot of failed pizzas result from unartful pairings of toppings that are good or great but not ideal on that particular pie. Clearly, there is enough culinary skill here to avoid any such miscues. I've stood in line for a lot of pizza - an hour at Frank Pepe, two hours for DiFara, three hours for Pizzeria Bianco. 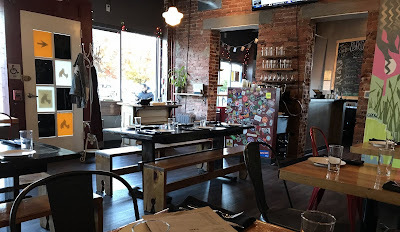 It's always gratifying to find great pizza where you can walk in, get seated and get a beer, and then place your order. We arrived around 5:30 and the place was nearly full by the time we left, but it seems you can get your fix of first-rate pie here with a minimum of hassle; you can even park at the broken (hence: free) parking meters on the side of the building. BIGA was a top-shelf experience; don't overlook this gem in the heart of Philly's Main Line.